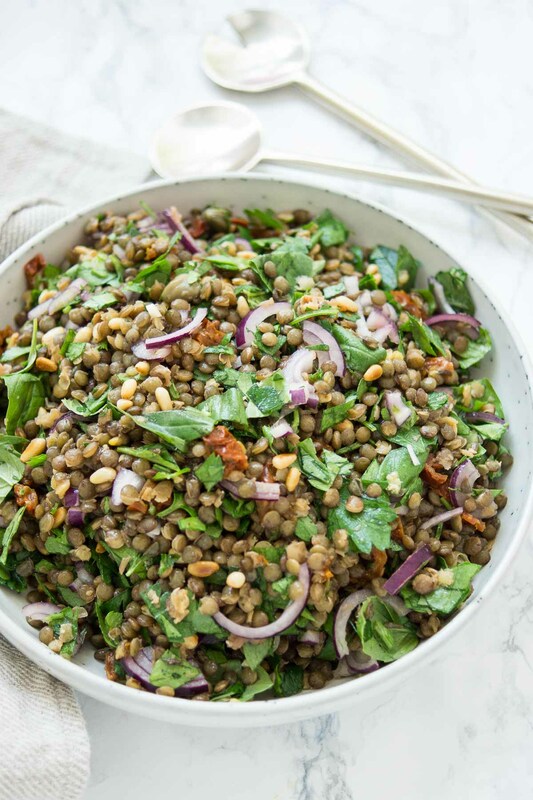 Meet my favorite Mediterranean Lentil Salad. It’s quick, easy and full of happy sunshine! 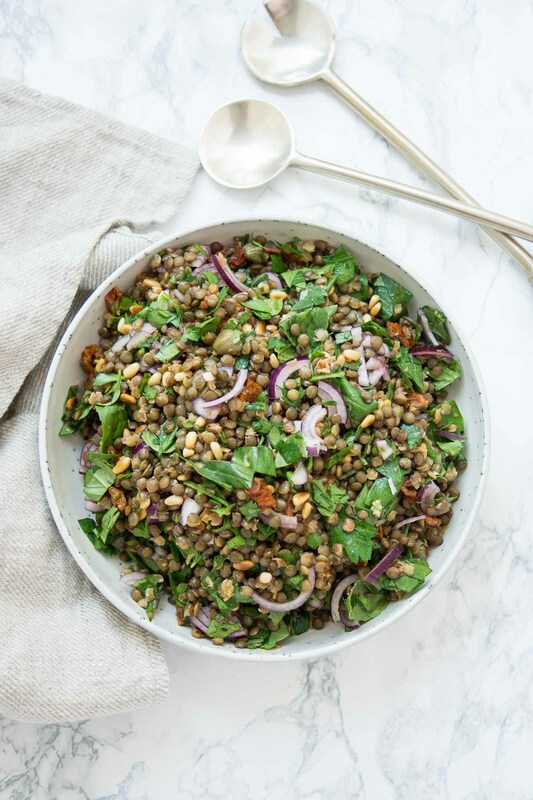 Sunshine that comes from all those tasty Mediterranean flavors of fresh lemon, sun-dried tomatoes, capers, herbs upon herbs, pine nuts and of course, a nice pile of French green lentils. Don’t forget shavings of parmesan and some salt and pepper. I use French green lentils for this salad, but you could use black beluga lentils, which are my other favorite lentils for salads. They’re called beluga lentils because they resemble caviar. I like them because they also retain their shape nicely. And smaller than green lentils, they are super cute! As humble as lentils are, they are super versatile and tasty. And as their own sort of “super food” they’re loaded with protein, fiber, iron, and lots of other goodness. I have so much love for them I even dedicated a post to just cooking lentils! Their flavor is quite earthy, so they go well with Mediterranean flavors: like salty, tangy, bright and fresh flavors. In this case, capers, lemon and of course fresh herbs, since they are the quintessential taste of summer. An easy to make, bright and flavorful Mediterranean Lentil Salad with sun-dried tomatoes, capers, fresh parsley, basil and pine nuts! Perfect as a side dish or served as a main meal salad. Place lentils in a large saucepan, cover with plenty of water and bring to the boil (generally, lentils should be cooked at a 1:3 ratio; lentils to water). Simmer over medium heat for 25-30 minutes, until al dente. Drain excess water and transfer to a bowl to cool. Add the red onion, parsley, basil, tomatoes, capers and toasted pine nuts to the bowl with the lentils. In a small bowl, whisk together the oil, lemon juice, and the pinch of salt and pepper. Drizzle dressing over lentils. Give everything a good toss. Taste and add more salt or lemon juice if needed. Serve with parmesan shavings, if desired. Enjoy! I love the taste of raw red onions, but one other trick worth mentioning is to add the onions to the lentils while they are still hot. This is said to tame some of their harsh bite while managing to keep their crisp texture. This Mediterranean Lentil Salad can easily be adapted by adding more herbs, some baby arugula, using toasted almond slivers instead of pinenuts, or sprinkling with a little feta. As you like! 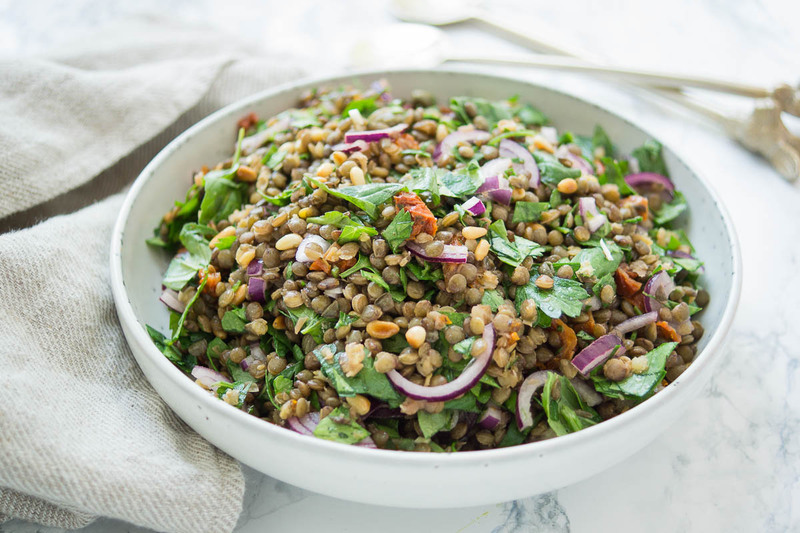 If you make this Mediterranean Lentil Salad recipe, I’d love to hear how it turned out for you! Be sure to rate it and leave a comment below to let me know! Especially if you have tips for other readers. Or take a picture and tag me on Instagram @ellerepublic and don’t foget to hashtag #ellerepublic so I don’t miss it!